Both methods should land a folder named mashpodder-svn23 in your home directory. Open this folder. The file we want to look at is mp.conf . Open it with gedit. The stock file should look like this. It’s pretty self explanatory. 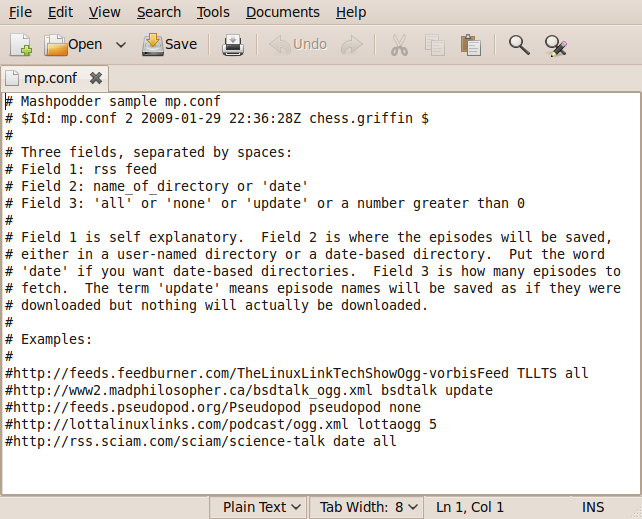 What is not explained is that mashpodder will auto generate a “podcasts” folder in your home directory and save the downloaded podcasts here in what ever folder you decide to put them in. Also, your mp.conf file will need to live in this podcasts folder also. 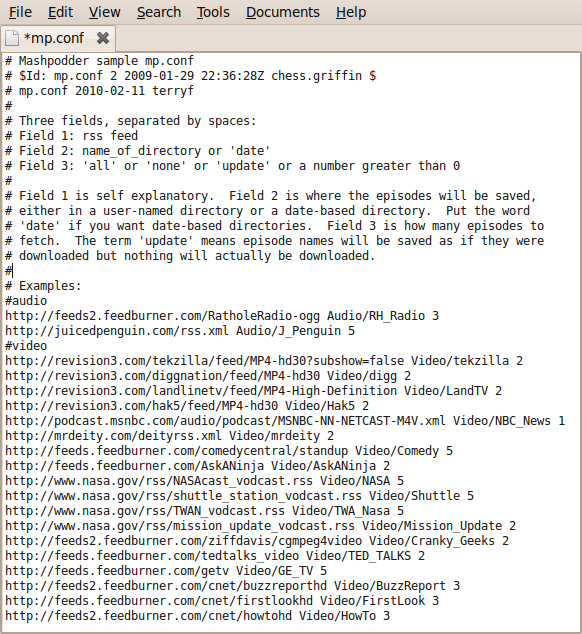 I just copied the mp.conf file from the mashpodder-svn23 folder to the podcasts folder… that I just created. Now make the necessary changes to the mp.conf file in your podcasts folder. I split mine into Audio and Video folders. It makes it easier to browse with the PS3. Now this is what my mp.conf file looks like as of today. It’s also located >here<. I only listen to 2 audio oggcasts on the PS3… because they are music. All other audio pod/ogg casts are handled by gpodder on my laptop. Those go on my portable media player. chmod – Changes the permission of a file. 755 means read and execute access for everyone and also write access for the owner of the file. It might seem like it’s not working but it is. Give it a few minutes. Now add the podcasts folder to your Mediatomb scan and all of the videocasts that mashpodder downloads should show up on your PS3 menu. Provided that they are the correct format. Check that out beforehand. Most videocasts these days are in the mp4 format(.mp4/.m4v) . The Mediatomb scan needs to be a recursive scan to get the subfolders. I”ll be redoing this whole series probably within the year. This is a trial run that is working out pretty good. Part 4 will cover cron. Every night I’ll be auto downloading videocasts and auto deleting old videocasts. Automation… dig it! Update: Field 3 in the mp.conf file doesn’t always work as advertised. I just added a new videocast and gave it a 3 in field 3 and it only fetched 1 episode. I should have gotten 3 of them. Oh well. I do know that it will stay up to date though.